Differently-abled Indian arm wrestler Shrimant Jha made the country proud on Friday by picking up a bronze medal at the Asian Armwrestling Championship, which is being held from April 16 to April 22 in Kazakhstan. 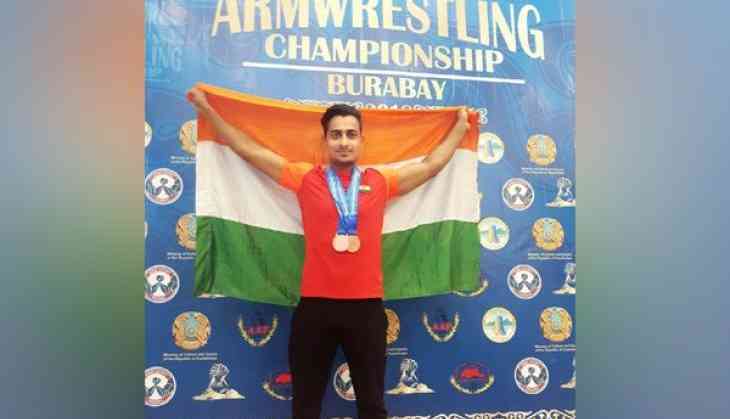 The 25-year-old, resident of Naxal-hit Chhattisgarh finished behind Tajikistan's Firuz and Magolia's Munkhbold to settle for the bronze in the 80kg senior category. Following the win, Shriman said he would continue to concentrate on his game and try to do better next time around. He further hoped that this time he gets a job from Chhattisgarh government. Jha, who was born with four fingers in both his hands, has been doing arm-wrestling since 2010 and started representing India since 2013. He is currently working as a junior engineer in a private company to support his family financially. Jha, who has five world championship medals, now aims for the upcoming Para Olympics.